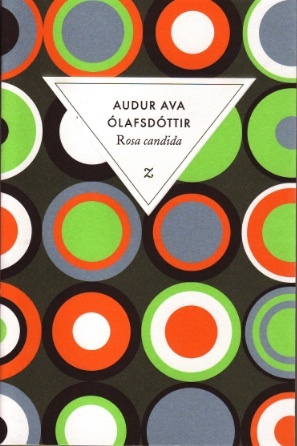 Improbably, Audur Ava Ólafsdóttir’s Rosa Candida (2007, French translation by Catherine Eyjólfsson, Éditions Zulma, 2010) is the third contemporary Icelandic novel I’ve read this year, following Jón Kalman Stefánsson’s lyrical and moving Heaven and Hell and Sjón’s (Sigurjón Birgir Sigurðsson’s) shaggy, showy, wildly poetic cabinet of curiosities, From the Mouth of the Whale. Both of those last books, as unusual and inventive as I found them, are novels of the sea, self-conscious riffs, at least in part, on folkloric fishing sagas of what I’ve come to think of, with nothing uncharitable intended, as the “god and cod” variety. As though announcing a deliberate departure from this staple of Icelandic writing, the beginning of Rosa Candida casually notes that Ólafsdóttir’s appealing narrator and main character, the 22-year-old Arnljótur (fondly referred to by his father as “Lobbi”) has just finished a stint working at sea himself, but is leaving all that behind, and in fact leaving Iceland behind, headed for warmer climes and an atypical, rather un-Icelandic career path: that of rose gardener. It’s not a choice altogether encouraged by Lobbi’s kindly father, who doesn’t see it as an auspicious direction for a young man, and who would prefer not to lose the company of his son following the recent accidental death of his wife, Lobbi’s beloved mother, who instilled in her son his love of plants – particularly of the rare eight-petaled white rose species known as rosa candida. Lobbi himself seems to lack a clear idea of what he’s doing; nor are we, as readers, entirely privy to his motivations. Along with his bereft father and a mentally disabled twin brother, Lobbi also leaves behind a newborn daughter, the inadvertent offspring of Lobbi’s casual, one-time tryst with Anna, a woman who has told him quite explicitly that she needs and expects nothing of him in the way of paternal responsibilities. And so, with little left tethering him to home other than the telephone lines he uses to update his elderly father on his pilgrim’s progress, Lobbi quits Iceland and these few important people in his life, with no convincing assurance to the reader that we’ll see any of them again. What subsequently unfolds is a simply told story recounting Lobbi’s journey to the continent to a remote monastery where he’ll occupy himself with the rehabilitation of its famous rosarium – and where, subsequently, the major life events he’s just lived through – his mother’s death and his incidental fatherhood - catch up with his impulsive and altogether innocent flight from them. There is little that’s dazzling in the language of Rosa Candida, no ravishing lyrical passages or unforgettable lines or great pearls of wisdom, no innovative narrative structure or daring literary experimentation or overt concern with social or political issues of the day (in the monastic world that the novel circumscribes, the wider world’s great problems – war, famine, poverty, oppression – exist beyond the frame). Yet, there is something quite remarkable here in this quiet, luminous novel; the text exudes an inner glow, a radiance verging on beatitude (not a word one often associates with contemporary fiction) that works on the reader at considerable depth. The linear narrative unfolds with unusual gentleness and measured pace, and with an attention to the quotidian that in less capable hands could have bogged down into a banal account of Lobbi’s every waking moment. But Ólafsdóttir’s touch is so light and so invested in the moment that one reads about Lobbi’s preparations, his journey by plane and car, his meals, his life at the monastery, his visits to the market, all the minor ceremonies of a day without finding them in the least bit tiresome (including what is certainly the first engaging description of the changing of a diaper I’ve encountered either inside or, for that matter, outside of a book). There’s a great deal going on in the margins and growing beneath the surface of this narrative. The deceptive simplicity of the story is ringed by death, accident, and coincidence, and more subtly by notions of foreignness and estrangement and the vagaries and difficulties of relation - and of translation - in their broadest sense. In the novel’s acute self-consciousness as regards departure from Iceland (I might add that all of the Icelandic literature I’ve read expresses an almost deliriously fervent and ruminative fascination with the natural landscape of the place that calls to mind that notion of a “nostalgia of the present”), it’s likely that the novel has a resonance among Icelandic readers that goes well beyond the usual elements lost in translation (I was particularly taken by Ólafsdóttir’s intriguing comment in an interview that “writers are foreigners to their mother tongue. Their job is to misunderstand language”). Even more pronounced is the welcome and subtle sort of velvet revolution Ólafsdóttir performs with regard to gender and family roles, gently turning them about with the naturalness and matter-of-factness of a gardener tilling the soil, and presenting, in her image of a contemporary holy family, a remarkably appealing model for paternity (anyone so myopic and reductionist as to think of Rosa Candida as primarily a “feminist” novel, however, may leave the room right now). One of Ólafsdóttir’s great strengths is an ability to handle large questions and what could easily be ponderous religious and natural symbolism with great dexterity and etherealness; this is not a novel of surface effects. The novel exerts the organic irrepressibility and assertiveness of life and of growth, as though a kind of inner gravity drew all things towards unity, as towards the candida rosa of Dante’s “Paradiso,” the multi-foliate rose of divine love and redemption that marks the fulfillment of the poet’s journey. And while this may be an odd thing to say about a novel - even to say to myself - I had the sense of being “cleansed” by Rosa Candida. Stepping out of the house into the late afternoon light just after closing the book, I found the world noticeably altered, more sentient and vital, more astonishing. Ólafsdóttir’s novel has been popular in Europe; it was awarded last year’s prestigious Prix de Page in France for best European novel of the year, and has received several other Icelandic, European and Canadian awards. An English translation of the book struck me as inevitable long before I’d finished reading the French one, as this seems one of the rare contemporary novels capable of standing up to literary critics and popular audiences alike. But, by a Rosa Candida-type of unlikely coincidence, I was amazed to discover that an English translation has in fact appeared today from Amazon Crossing (under the title The Greenhouse, and not The Offspring, the more literal title used in on-line English commentary about the book). The novel’s thematic elements of soul-searching, reconnection and the search for meaning will have wide appeal, and I wouldn’t be surprised to see a film version of the book follow. But the delicateness of Ólafsdóttir’s accomplishment is evident in imagining just how easily a film version could transform the gossamer fragility of the work into sentimental pulp. One might also initially mistake Rosa Candida as yet another of those proliferating contemporary literary vehicles for tidy adult resolution of childhood conflicts that more often than not adopt the language of therapy (a friend has exasperatingly warned her book group that she’s had it with novels containing the words “Club,” “Memory,” or “Daughter” in the title). But sentimental pulp is one thing Rosa Candida is not. This is a highly accomplished, subtly vitalizing and ultimately ambiguous work written with confidence and depth. Among the three impressive contemporary Icelandic novels I’ve read this year, Rosa Candida takes the prize. The Life and Times of J. 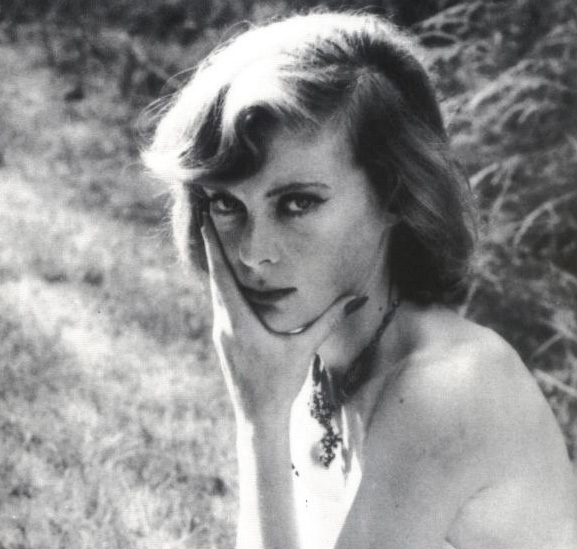 In the annals of sins of omission and unintended psychological cruelties, Caroline Blackwood’s early novel, The Stepdaughter, is one nasty little book. This epistolary novella takes place entirely within the correspondence of “J.”, a well-off New York divorcee (well, soon-to-be-divorcee) who, rather than communicate meaningfully with any real person, writes letters into the void (it’s a one-way correspondence in all but a metaphorical sense). This echo chamber finds its physical analogue in the luxurious high-rise apartment which serves as a cell from which J. spends her time peering out listlessly onto its breathtaking view of Manhattan and trying her best to ignore the impingements of the apartment’s other inhabitants: her four-year old daughter Sally Ann; Monique, the homesick French au pair sent over by J.’s former lawyer husband Arnold; and one very big, living, breathing problem, J.’s lumpish adolescent stepdaughter, Renata. These increasingly strident and desperate letters - which J. closes “Yours hopefully,” “Yours in a state of restless anxiety,” “Yours miserably,” and so on, in a disorder that mirrors her emotional condition - piece together for the reader how this menagerie of miserable females came to be, and read like searing, furious eruptions from J.’s incredulity at having arrived at such a state. The unfortunate Renata, object of the novel’s title and undeserving target of all of J.’s unhappiness, is herself abandoned, with Arnold having decamped to France to pursue a nubile Parisienne and dumped on the unwitting J. this daughter from an earlier marriage (Renata’s mother, yet another unfortunate, is apparently confined to a mental institution in California). Shunned by the adults she’s known in her short life, and now sentenced to live with the latest one into whose neglect she’s been committed, the pudgy Renata spends her days padding back and forth between her room, where she does nothing but watch TV, and the kitchen, where she endlessly bakes and devours cakes from instant mixes “as if,” writes J., “she is hoping that in some camel-like way her body will be able to store them up and enable her to survive the desert future she fears must lie ahead.” J.’s obsessive letters reveal an unbearable, almost obscene tension between the sense of obligation she feels for Renata, whom she cannot see as anything but pitiable – an “ugly, untalented adolescent, whom no one wants” - and her own repulsion at this child who isn’t even hers and who seems to sum up, in her slovenly clothing and increasing girth, J.’s failed marriage and dimming prospects: “something even worse than my past: she is not only my present, she is also my future. That is why I find her presence in my apartment so intolerable.” Any care of J.’s own daughter, Sally Ann, has been relegated to the miserable Monique, who spends her spare time writing her own desperate letters of woe to friends and family in France, complaining of her awful employer and pining for the day her contract will at last come to an end. The confined world that Blackwood depicts is nearly hermetically sealed off from the outside. J.’s letters to no one underscore the life that primarily unfolds within her own head. When at last she dares a moment of actual communication with Renata in an effort to rid herself of this unwanted burden, the result is nothing at all like the one that J.’s comfortable assurance has predicted, revealing Renata’s unhappiness as largely a projection of J.’s own and Renata as a perceptive child well aware of where she stands in J. 's world. J.’s solipsism takes a blow; the world delivers, in a single moment, a glaring, unexpected dose of reality out of sync with the ruminative narrative of J.’s own bitter thoughts, though in her quietly manic effort to tamp the world back down into something controllable and confined, she nonetheless wages a recovery. The police officer was one of those big, clumsy, bull-like men who move around very slowly and have tired little I-have-seen-it-all eyes. He had a scarlet neck which looked as if it had absorbed more experience than his face, and it came bulging over the collar of his uniform with every inch of its weatherbeaten surface decorated by the most unpleasantly elaborate lithography of deep cracks and creases, which were all overlaid by a feathery tissue of spider-web lines. This talent for description and scathing, ironic humor makes The Stepdaughter’s nastiness almost bearable. To make the novel more palatable, I was tempted to imagine it as one of those histrionic Charles Busch plays, one of which I’d fortuitously read just prior to picking up The Stepdaughter. But for all the strident anxieties on the verge of a nervous breakdown in Blackwood's novel, The Stepdaughter is resistant to camp; her acute understanding of the moral psychology of her characters would make such a reading fall flat. One can’t help but feel for J., both victim and victimizer. Nothing in her emotional life is simplified or prettified. It’s as though Blackwood has stripped her down to bare her most hidden feelings in all their awful complexity, and what’s there is as honest as it is ugly. There’s an odd sort of bravery in that. But that those feelings remain, for most of the novel, transmitted only via these letters to no one, never to be sent, emphasizes in a piercing manner the complex tragedies born by a failure to communicate. This is a novel in which the characters have tenuous relations to begin with, but in the absence of communication they revolve awkwardly around one another like planets in a nebulous solar system without a sun, drawn and repelled only by their own gravitational forces. J. 's drawn out decision to speak to Renata, after so much time spent living among her own thoughts, leads to a conclusion not unlike a more high-pitched, post-Kafka version of the revelation of wasted life that occurs in Guy de Maupassant’s famous story “The Necklace.” There’s not a whole lot of consolation in learning the truth, but getting to watch it delivered with such psychologically incisive insight, crystalline clarity and caustic wit makes The Stepdaughter a deliciously horrible and haunting book.